Appletree Cottage01263 715779work01603 870304fax Self-cateringThis superb roomy flint and brick detached cottage upholds the traditional regional architecture of Norfolk. Well-presented, this property features comfortable furniture and excellent utilities to make your stay as relaxing as possible. Weybourne is home to a great shingle beach, but only three miles away is also a fantastic sandy beach at Sheringham. 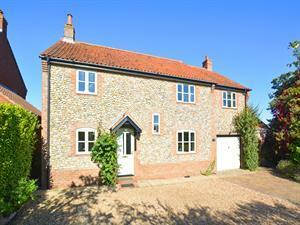 This superb roomy flint and brick detached cottage upholds the traditional regional architecture of Norfolk. Well-presented, this property features comfortable furniture and excellent utilities to make your stay as relaxing as possible. Weybourne is home to a great shingle beach, but only three miles away is also a fantastic sandy beach at Sheringham. The main street of Weybourne, cottage is on right going from church in Blakeney direction. From Norwich to Sheringham then bus or taxi.